At the proper time he reaped cheerfulness. Our holy Father George was born in Cyprus towards the middle of the sixth century. 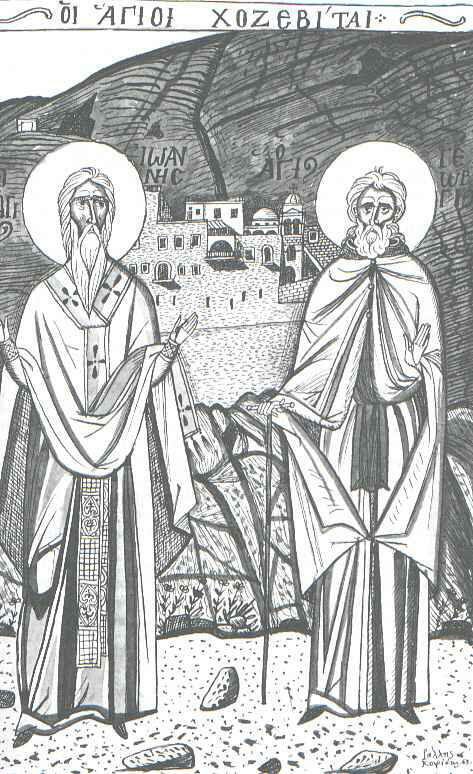 After the death of his devout parents, desiring to embrace the ascetic life and to escape the marriage arranged for him by his uncle and tutor, he fled to the Holy Land, where his elder brother Heraclides had already been living for some years as a hermit in the Lavra of Calamon on the banks of the Jordan. Finding him still too young for eremitic life, his brother took him to the Monastery of the Mother of God at Chozeba on the road from Jerusalem to Jericho, which had been founded in the previous century by Bishop John of Ceasarea (Oct. 3). After receiving the monastic tonsure, he was placed with an elder from Mesopotamia, who was severe and unjust; but his disciple obeyed him meekly, patiently and humbly, as if the Lord Himself manifested His presence through him. 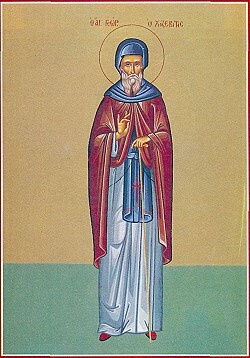 One day, as he was late bringing water from the stream, his elder struck him a violent blow in the presence of the whole community, whereupon his hand immediately withered, seized with paralysis, and he recovered the use of it only at the prayer of his disciple before the tomb of the Saints of the monastery. To escape the vain admiration of men, Saint George then fled and made his way to Calamon, where for many years he shared his brother's cell and admirable way of life. He was obedient to him in everything and regarded him as his father in God rather than as his brother according to the flesh. With never an idle word, they persevered ceaselessly in prayer, and for food they made do with moldy leftovers covered in worms that were kept for them from week to week. George's prayer soon found such favor with God that he was able to make a barren tree bear fruit or approach a formidable lion without fear. 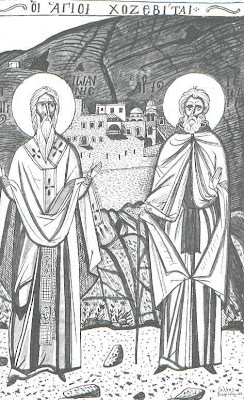 Heraclides fell asleep in peace at the age of seventy, renowned as the very model of humility, and George, alone in their cell now, carried on in his brother's footsteps, while always remaining ready to serve his brethren in the Lavra. 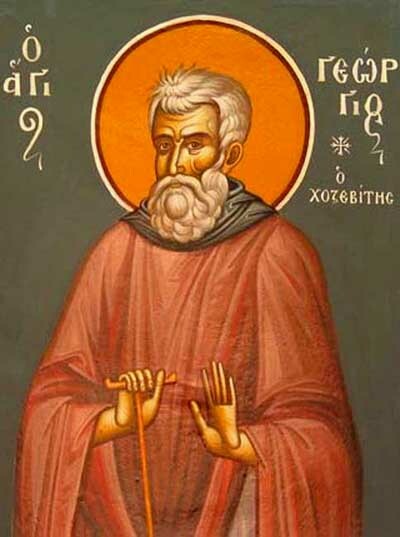 On the death of the Abbot, the troubles which disturbed the community over the election of his successor caused George to leave Calamon and, on a sign from God, to return to Chozeba, the monastery of his tonsure. Abbot Leontius received him there with joy and assigned him an isolated cell, leaving him free to lead the kind of life that suited him. Remaining in seclusion throughout the week and keeping his spiritual labors a close secret, he joined the cenobitic community on Sundays, spoke of things useful to the soul, and would receive with especial care the confession of thoughts of the brethren. He used to collect leftovers from the common table during the week, which he dried in the sun and ate. In spite of numerous assaults of demons aimed at interrupting his rule of prayer, he would never break it for any reason, and he never spoke a word without an inspiration from God; he thus won great power over unclean spirits. His anchoretic life did not prevent him from being eager to serve his brethren, and on bread-baking days he was always ready to look after the oven, whose heat was all the more stifling in the climate of the region. Although there was nothing of him of the spirit of judgement, when he compared contemporary monks with those of old, he would often lament their lack of fervor and fear of God, and their indiscipline during the services; above all, he found fault with those who, taking credit for the many years they had spent in the monastery, treated their lay brethren and sinners with disdain. "Believe me," he said, "even if someone were able to make heaven and earth anew, but regarded his neighbor with proud contempt, he would labor in vain and his portion would be with the hypocrites (cf. Matt. 24:51). A man cannot approach God unless he is at peace with his neighbor. The sins and passions all have pride as their common source and they lead to death; while obedience and submission to the Lord are life, joy and light." 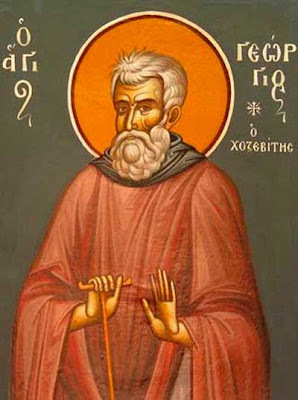 He taught his monks to free themselves of their passions by fear of God shown in labor, tears, prayer, and fasting; and he exhorted them to vie with one another in humility by keeping themselves from all criticism or jealousy of one another so as thus to attain holy charity, the "bond of perfection" (Col. 3:14). Following a vision on the eve of the Persian invasion (614), he predicted the fall of Jericho and the siege of Jerusalem. The Abbot and brethren therefore had time to flee, some to Arabia, others to caves. He himself was unwilling to leave the place where God had placed him, although the entreaties of his disciples prevailed with him at last to take refuge at Calamon. Most of the monks were discovered by the invaders and massacred or taken into captivity. Saint George, however, commanded the respect of the barbarians and was left at liberty. He returned to Chozeba, where he lived as a recluse in the monastic enclosure for the remained of his days, served by Anthony, his faithful disciple and biographer. 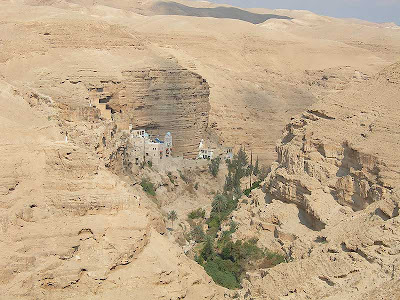 Thanks to his prayers, the Monastery never lacked bread and oil for its guests, despite the famine and misery which followed the fall of the Holy City. In extreme old age, he fell ill and, realizing that the moment of his departure from this life had come, he sent for Anthony. The latter was busy looking after the guests and was unable to come to his bedside immediately. The Elder therefore sent to say to him, "Don't worry, I shall wait until you have finished your duty." When his disciple arrived towards midnight, he embraced him and said, "Depart, my soul! Go to the Lord!" And he fell asleep. From The Synaxarion: The Lives of the Saints of the Orthodox Church (Vol. 3), by Hieromonk Makarios of Simonos Petras (2001). Thou didst prove to be a citizen of the desert, an angel in the flesh, and a wonderworker, O George, our God-bearing Father. By fasting, vigil, and prayer thou didst obtain heavenly gifts, and thou healest the sick and the souls of them that have recourse to thee with faith. Glory to Him that hath given thee strength. Glory to Him that hath crowned thee. Glory to Him that worketh healings for all through thee. God-bearing Father George, you cultivated the word of grace and gathered the splendid fruits of righteousness, having chosen the way of godliness. Therefore, you partook of the glory of Christ; intercede with Him unceasingly that He may have mercy on our souls. You have appeared as a brilliant light and have illumined with divine rays those who cry to you, O George. Pray for us to Christ the Master, Who appeared in the waters to illumine those born on earth.